As you know from previous blogs, I have been having some financial challenges with my car breaking down among other things. This week was no different. I had some pretty high anxiety, which I put into my hill training and managed my stress by going for a good long hike. The physical outlet keeps me sane. Yes, when you feel the weight of your stress pressing down on your shoulders, pounding in your head, keeping you up at night the last thing you feel like doing is going for a jog. You want to stay in bed because it’s dark outside and you are feeling dark inside. My motivation comes from two things. Knowing to my core that if I go jog, I will come back feeling lighter, happier, stronger and far more able to handle what is in front of me. I see the value it has in my life. I see the change in my behavior. I now am being the person I always knew was inside. I am so fiercely determined to create a happy, joyful and inspired life for myself that going for a jog on a dark morning is just one of the steps to get there. I am digging to the very root of issues, patterns and behaviors and examining them, understanding them and finally changing them. Is it fun? Nope, it’s painful. Is it worth it? ABSOLUTELY. 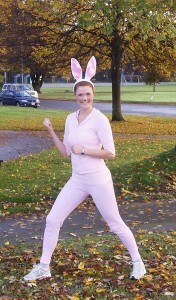 So I ask you, does this woman, in a bunny outfit, jogging 10k on Halloween along the seawall making people laugh, clap, honk and cheer look like she’s given up to you? No, despite my stress and the anxiety I was feeling the night before (heavy sobs into a pillow), the next day I got up, put my ears and bunny tail on and had a great morning with my trainer and friend, Jody Kennett. We laughed and had such a good time! It’s all a matter of thinking in terms of being a victim or empowering yourself through actions. So, I left the broken car home, ‘hopped’ into Jody’s vehicle and we drove to the seawall to jog. I could have stayed in bed and cried some more, but instead I had a morning full of people smiling and wishing us a good morning, cheering, laughing, honking and even taking my photo. That was the better choice. That was the choice that lifted me up and in turn, lifted others up too. 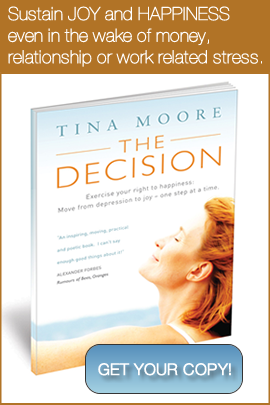 Stress can weigh you down, but there are healthy choices that can lift you back up again. PS. If you find this blog helpful please pass it on to others and if there is something you’d like me to write about, please contact me and let me know! I’d love to hear from you. PPS. I have some new articles on EzineArticles if you are interested. You go girl! You are amazing and inspirational! Stay true to who you are, you are awesome……and funny! Thanks so much Janice, and congratulations on your ezinearticles! !